If I eat well, why do I need to take daily vitamins after bariatric surgery? 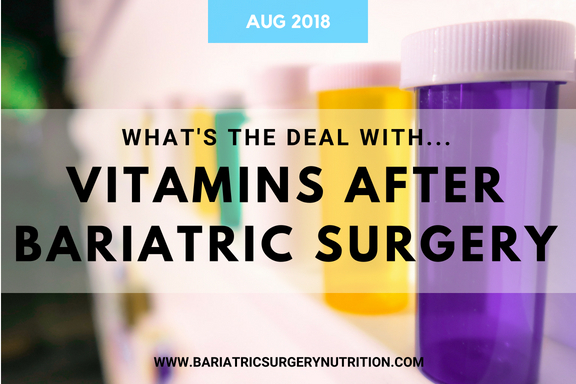 Even if you have three balanced meals and two to three balanced snacks every day after bariatric surgery, you’re still almost guaranteed to develop multiple vitamin and mineral deficiencies if you’re not taking daily vitamins. It’s not IF you will develop micronutrient deficiencies, it’s typically a matter of WHEN. 1. First of all, and most obviously, you’re no longer able to consume large enough amounts of foods to meet your micronutrient (i.e. vitamin and mineral) needs. 2. Secondly, your body now absorbs and processes foods differently. For example, if you had a malabsorptive weight loss surgery (e.g. gastric bypass or duodenal switch), in addition to eating smaller portions of foods, you’re also not absorbing 100% of the nutrients in the foods that you’re eating. Interestingly, even in the non-malabsorptive procedures (e.g. sleeve gastrectomy and band) we see changes in nutrient processing. For example, you may no longer have enough stomach acid in your small stomach to efficiently absorb the natural calcium found in dairy products, which is why you’ve been prescribed a special type of calcium, calcium citrate, that doesn’t require stomach acid to be absorbed. The signs and symptoms of vitamin and mineral deficiencies can be mild to severe. Some take only weeks to occur, while others take years to develop. While many deficiencies are reversible (e.g. anemia, or low iron), several micronutrient deficiencies are irreversible (e.g. osteoporosis, or bone decay due to inadequate calcium and vitamin D, and neurological damage due to inadequate B vitamins). Moral of the story? Take your vitamins! How often should I be going for blood tests? Your bariatric team will tell you how often you should have blood tests done. It’s most likely that you’ll have a blood test after your surgery, while you’re still in the hospital. Following this, your next blood test will be in three to six months and continue every three to six months until your first year after surgery, depending on the type of surgery you had. If your blood tests are looking great at one year after surgery, this is a good sign and means that you managed to get through the first risky year after bariatric surgery without having developed a deficiency! But this doesn’t mean that blood tests are no longer needed. You’ll need to do blood tests to check for nutrient deficiencies for the rest of your life. As you get older, your body needs more of some nutrients and less of others as your body changes. Some deficiencies also take a longer time to develop. For this reason, you may still develop deficiencies over time, even five to ten years after surgery. We’ve seen many patients who stopped doing their blood tests because they felt fine only to find out years later that they have multiple severe deficiencies. Feeling good doesn’t mean everything is good. And there’s a reason why. You begin feeling unwell and develop symptoms of deficiencies. Feeling unwell is the last step in this process. These steps can take only a few weeks for some nutrients, and up to several months for others. When you begin to feel unwell, your body has already been through weeks—or months—of missing an important nutrient. Blood tests can catch these deficiencies at a much earlier stage. For example, say you stopped taking your iron pill. You wouldn’t feel an anemia, or an iron deficiency, developing. Gradually, over time, you’ll begin to get tired and you might figure it’s just your busy lifestyle. You’ll begin to feel worse and wonder if you’re just not getting enough sleep. Then you’ll become increasingly lethargic and notice your hair has lost its shine and is getting brittle. Lastly, you’ll notice that you can hardly get through your morning routine without having to sit down and take a break. You’ll go to your doctor who will order blood tests. The blood tests will come back diagnosing you with anemia. Luckily, you’ll restart your iron supplement which will reverse this condition, although it’ll take about three months until you feel like yourself again. However, some deficiencies aren’t reversible which can leave you unwell permanently. Have your blood tests done regularly as suggested by your bariatric team. You’ll eventually only have one blood test per year, but this will only be the case at two years after bariatric surgery or until your blood tests routinely come back normal. If you no longer see your bariatric team, or live too far from your bariatric center, make sure that your family doctor is testing you for bariatric surgery-related deficiencies. The routine blood tests that your family doctor performs aren’t the same ones that your bariatric team orders. We look at so much more. Ask your family doctor if he/she is looking for all the nutrients necessary for bariatric surgery. They can receive this information from the bariatric clinic where you had your surgery. We are compassionate and enthusiastic registered dietitians (RD/PDt) specialized in working with adults before and after bariatric surgery. With over 10 years of experience, we are highly specialized in all aspects of bariatric surgery. We are patient and committed, and most importantly, we understand that life after bariatric surgery is filled with many new challenges and lifestyle changes. 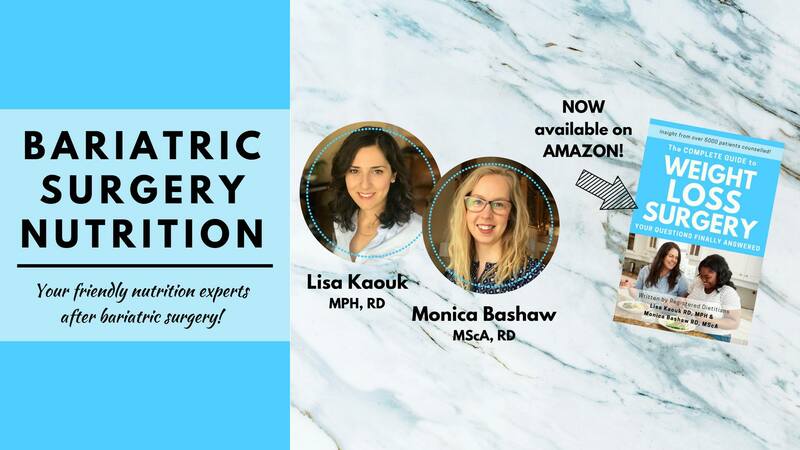 Authors of "The Complete Guide to Weight Loss Surgery: Your questions finally answered". Available on Amazon.com, Amazon.ca, or our website (PDF download). Have you reached your "best weight"? Is all cheese the same?